The University of Redlands’ creative writing faculty kicked off this fall’s Visiting Writers Series with work of their own, “hot off the press,” as Greg Bills, professor of fiction and co-director of the Visiting Writers Series, put it. Joy Manesiotis, professor of poetry and co-director of the Visiting Writers Series, shared an excerpt from her lyric essay, “Doubt.” “According to recent discoveries in behavioral epigenetics, our experiences and those of our ancestors never go away, but are lurking as ornaments to our DNA,” she read. 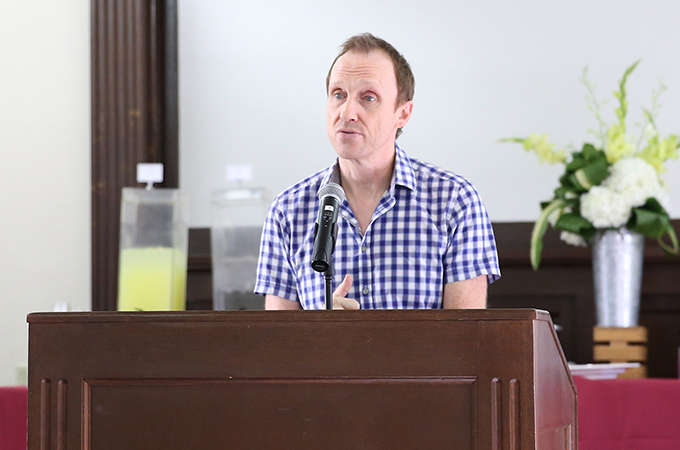 Gary Amdahl, professor of fiction and nonfiction, proclaimed he had finished his genre-less piece that afternoon, to the understanding laughter of a room full of writers. Pat Geary, professor of fiction, followed with three poems, the third of which incorporated the dreamy painting motif often found in her poetry. When Bills approached the podium with, “If you’ve attended the faculty reading the past two years…” I knew immediately we were in for another enjoyable installment of his murder mystery novel. Ralph Angel, professor of poetry, concluded the evening with four untitled poems that are part of 10 in a series. The next installment of the Visiting Writers Series will take place on Thursday, November 16, and will feature fiction writer Sean Carswell and poet Marsha de la O. The student-run reading series, Bird on a Wire, will host its next reading on Monday, October 23 at 9 p.m. in the LaFourcade Community Garden. All are invited to bring their own work, or the work of authors they admire, to read.